Tropic Air, The Airline of Belize, has announced April’s results of its 2016 nationwide #TropicGivesBack charitable fundraising campaign. For every ticket bought at the month’s selected station, $1 is donated to an organization chosen by our staff stationed in that community. 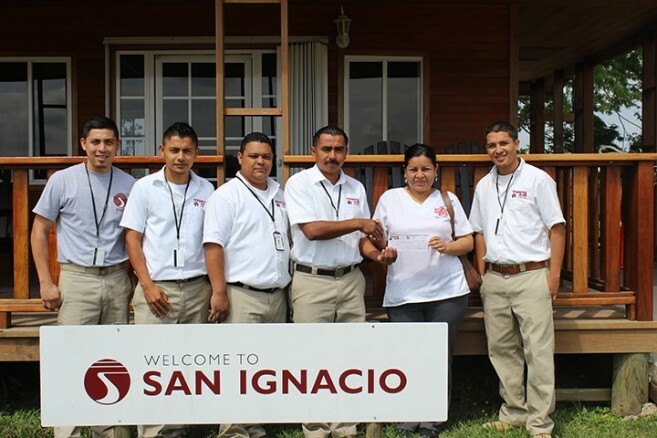 April was the chosen month for San Ignacio. As part of the airline's largest charitable fundraiser of the year, Tropic Air business partners, staff and Customers joined efforts and raised $450 for the Octavia Waight Centre in San Ignacio. A check was presented to the organization on Friday, May 6th. “I also want to pay tribute to the hard work and dedication of our Tropic Air staff who do so much to encourage our customers to support this remarkable program,” said Steve Schulte, Tropic Air CEO. “Our staff pride themselves in being involved in their communities, and this is one way we do that”. The Give Back program moves Punta Gorda this month, with Corozal scheduled for June. Founded in 1979, by John Greif III, with just a single airplane and two employees, Tropic has steadily grown to become the largest and most experienced airline in Belize. It now employs over 300 staff, and offers over 200 daily scheduled flights with 14 aircraft to 18 destinations in Belize, Mexico, Honduras and Guatemala. Tropic Air joined IATA’s ISSA Registry in 2015. In the same year it carried 320,000 passengers and moved 424,000 pieces of freight system wide.